I was paddling back after riding a wave. I’d been catching and riding small waves in the smallish waves brought on by the low tide all morning. My rides were not graceful, nor did they look like the strong, vibrant adventures of the other women around me – but it didn’t matter. I was smiling. My heart was full. But I knew that I only had a few more waves left. This was our last morning – and as much joy as there was in my heart – my body was telling me that I needed something more. Something BIG. Something dramatic – as a reminder that I’d shown up as the true me. Somewhere in between paddle strokes, it hit me. I wanted – needed actually – to surf with a mohawk in my hair. You might find this craving strange. I did. I don’t think I’ve ever intentionally fashioned my hair into a shape just because. And yet, I knew this would be the vibrant reminder that I needed to make sure that I could go out with my last few waves with determination instead of expectation. You see, I am not an amazing surfer. At the end of my second SwellWomen surf retreat I knew that I’d made progress – but to say that I had a LONG way to go to look confident on even beginner waves, is a massive understatement. In many ways, I’d embraced sucking at surfing. I was having fun and that was all that mattered. I was falling, laughing and getting out there again. What more could I ask for? I took a deep inhale and exhale every time I positioned myself in the lineup, ready for my encouraging instructor to give me a swift push and tell me to stand up rather than paddle (I’d clearly embraced the idea of slowing down a bit too much). I looked out at the tip of my board, with a steady gaze while I repeated “I activate the hope within me” as the energy of the incoming wave made contact with the bamboo-colored hard-top surfboard that I’d learned to love in a few short days. But my intuition told me that I needed to celebrate with more boldness. Maybe I hadn’t stood with as much grace and strength as I’d hoped. But I showed up. I tried multiple boards and graduated from a soft-top to a hard top. I was persistent, joyful, and determined. This was a matter of attitude versus skill and I wanted to carry the feeling of the wave with me – through me. And for some reason, surfing with a mohawk seemed like the perfect way to embody the energetic vibration that moved within the waves. I'm already a big believer in the power of a hairstyle to transform your life. So there I was, in the middle of the Mag Rock lineup, styling my already short hair into a mohawk. My surf sisters and instructor giggled in my direction. But I was ready. To go big. To enjoy big. To laugh big. To surf big. To play big. I caught two more waves (that I can remember), powered by my mohawk to propel me through the line and towards the shore. With each new wave, I channeled all of the life force of the ocean – but more importantly – the energy within me to step – (or surf) into my exuberant joy. It almost didn’t matter what happened after caught the wave at that point. In fact, I couldn’t even tell you what my form looked like (or didn’t). 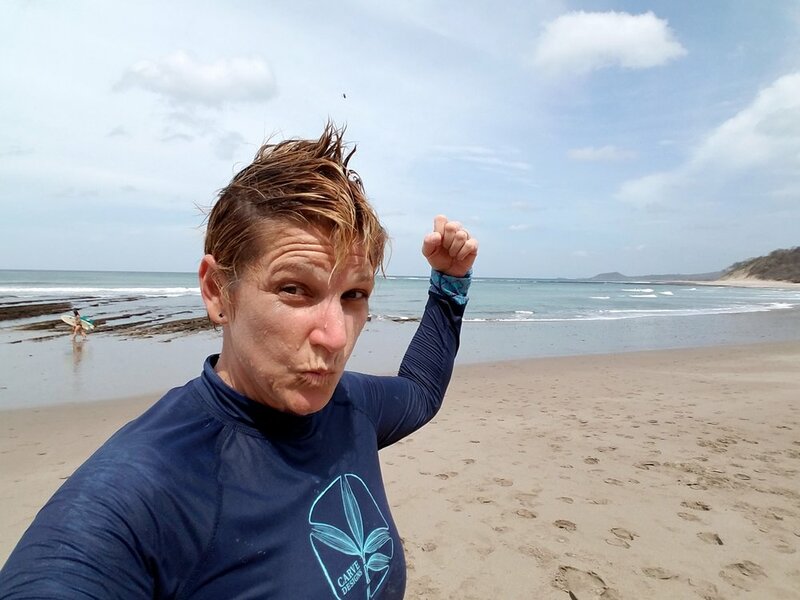 But armed with my mohawk and fierce determination to enjoy myself, I’d finally been able to let go of any lingering attachments to what it meant to be a surfer girl. I was so totally in the moment. One with the power of the ocean and of my essential self – rooted in a new and deeper level of TAO-ness (“Transparent, authentic and open” in Martha Beck life coach speak or “The Way” in Chinese traditions). In surf lingo, I guess you could say that I was completely and utterly stoked. I hadn’t thought it was possible to smile more than I’d smiled the first time I landed an epic belly flop off my surfboard. How could I possibly learn a more important life lesson than embracing joy even while falling? Not only does everyone need to learn to (and enjoy) falling – but on that last day at Mag Rock on Popoyo Beach – I learned that everyone needs to surf with a mohawk in their hair every now and then. And maybe, just maybe...we need to really let loose and wear a mohawk to the grocery store, yoga studio, work meeting or dinner date. What would life be like if we could all be so bold, alive and authentic that we could each find the perfect mohawk moment in everyday life?